Stronger, faster, further— we are all looking for an edge in our training. That is why Advanced Molecular Labs has created the most advanced scientifically based product ever developed, based on the latest cutting-edge performance nutrition, research, ingredients and dosages that will completely PREPARE you for your next workout. AML Preworkout contains a unique synergistic blend of scientifically researched compounds that will pack your muscle cells with energy and increase strength, power and endurance so you can push your body to the limit for longer periods of time. In addition, it activates the perfect blend of neurotransmitters to boost your mood, motivation, mental alertness and focus so that you get into the gym and start training with the utmost intensity and resilience! A primary contributor to pre-workout fatigue is a weary central nervous system (CNS) that requires more than just energy from food to get you going. Fortunately, AML has discovered a unique blend of compounds that conquers CNS fatigue by reestablishing the required levels of the correct neurotransmitters to restore focus and motivation needed for intense training. INCREASES ADRENALINE FOR AN EXTRA BOOST. Adrenaline activates several biochemical pathways that increase glucose and fatty acid levels in the blood, which provides energy for the muscle cell. The remarkable ability of AML Preworkout to simultaneously increase adrenaline and dopamine provides an even more robust neurochemical environment in the brain for even greater mental focus that bolsters performance in the gym. AN ENERGETIC BUZZ FROM CAFFEINE. While increased contractile forces and energy production within muscle from caffeine consumption preferentially influence high-intensity weight training, caffeine’s ability to stimulate the CNS has a greater impact on the mental aspect of training. The surge of dopamine and adrenaline from caffeine consumption will amp-up your neurochemistry for greater concentration and intensity while training in the gym. ADRENALINE PIPERINE (BIOPERINE) PROVIDES ADDITIONAL RELEASE. 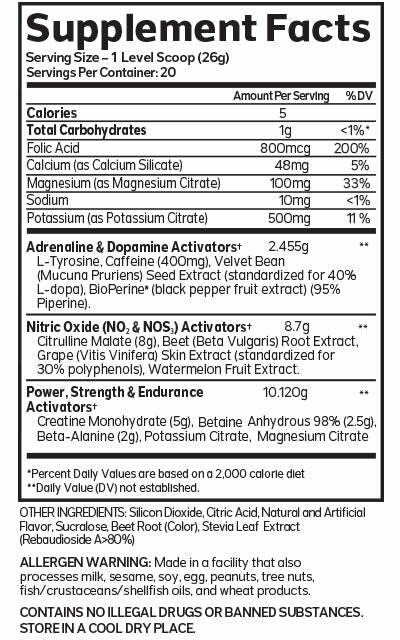 Another neurotransmitter-enhancing compound found in AML Preworkout is the compound piperine, which is naturally found in black pepper. Piperine has been reported to trigger adrenaline release by activating the TRPV receptor in the brain, which stimulates the sympathetic nervous system, resulting in adrenaline release. It also improves the gastrointestinal absorption and systematic utilization of nutrients in AML Preworkout. IMPROVES FLUID BALANCE IN THE MUSCLE FOR GREATER STRENGTH GAINS. Natural osmolytes like betaine, found in many different foods such as whole grains, spinach and shellfish, maintain cell volume and fluid balance during stressful situations such as dehydration. Betaine also plays a key role in many aspects of human health, as studies have shown that diets high in betaine decrease the risk for certain diseases. In addition, it has been shown that betaine significantly increases anaerobic power in the bench press and squat. Interestingly, additional studies have also shown that betaine increased muscle protein synthesis and lean body mass. ENHANCED BLOOD FLOW AND STAMINA. The signaling molecule nitric oxide (NO) enhances performance by increasing blood flow caused by improved vasodilation. The increased blood flow from vasodilation delivers more essential nutrients and oxygen to laboring muscles while simultaneously removing metabolic waste, which collectively enhances muscular performance. NO is biosynthesized from the amino acid arginine, meaning increased consumption of arginine ought to boost greater production of NO. However, arginine is poorly absorbed by the intestine and is quickly broken down by the liver, which reduces its capacity to increase NO production and making it a poor choice for increasing NO. On the other hand, the amino acid citrulline, which is quickly converted in the body into arginine, is more effectively absorbed by the intestines and avoids breakdown by the liver. Consequently, taking AML Preworkout, which contains citrulline (as citrulline-malate), represents a fantastic way to vigorously increase endogenous arginine levels and drive NO production for considerably improved stamina. 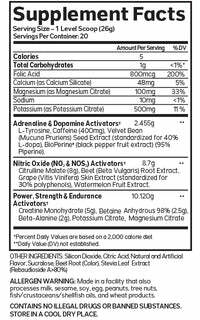 AML Preworkout does not contain agmatine (Decarboxilated form of arginine), which may inhibit NO production. In addition to the potent NO-booster citrulline, AML Preworkout also possesses watermelon extract, beetroot extract, and grape skin extracts, which are rich in food anti-oxidant compounds that have also been shown to powerfully stimulate NO production for an added influence on vasodilation and performance enhancement. Plus it contains folic acid, which functions as a co-factor for the enzyme dihydrofolate reductase, which synthesizes BH4. Oral consumption of folic acid can improve NO production and vasodilation. ENHANCED CIRCULATION WITH POTASSIUM AND MAGNESIUM CITRATE. Numerous studies have shown that higher potassium and magnesium intake reduces the risk of stroke and many other cardiovascular diseases, likely due to their capacity to increase vasodilation, which reduces blood pressure. Although it is not well understood how these two elements enhance vasodilation, the incorporation of these two elements into AML Preworkout fortifies its capacity to bolster cardiovascular performance for improved endurance. Potassium and magnesium has also been shown to prevent muscle cramps and improve energy metabolism. Citrate has also been shown to improve exercise performance by buffering lactic acid buildup in the muscle, further upgrading performance. ERADICATES LACTIC ACID FOR IMPROVED ENDURANCE. The accumulation of ammonia reduces energy production while also increasing lactic acid production, which consequently has a negative influence on exercise performance. Citrulline reduces the accumulation of ammonia, subsequently reducing lactic acid accumulation as well. Furthermore, citrulline has been found to reduce lactic acid levels during high-intensity exercise and significantly improve exercise performance. UNIQUE PERFORMANCE-ENHANCING BLEND THAT AUGMENTS MUSCULAR POWER. AML Preworkout is loaded with an assortment of the most effective performance-enhancing compounds available for boosting power, strength and endurance, including creatine monohydrate, which is the most studied form of creatine on the market. In addition, creatine monohydrate is also one of the most heavily used supplements, primarily because its effectiveness at improving power and strength. Many studies over the years have clearly shown that creatine monohydrate supplementation increases power output during intense exercise, stimulates muscle hypertrophy and drives muscle growth. GREATER MUSCLE GROWTH AND RECOVERY. Intense weightlifting or exercise puts stress on the muscle cell, producing muscle damage that requires a recovery process to regenerate muscle function and increase muscle size. There is emerging evidence to suggest that reactive oxygen species (ROS) produced during intense training assists the recovery process. Moreover, it's been shown that consumption of the powerful antioxidant vitamin C, which chemically negates ROS function, can attenuate the recovery of damaged muscle implying that antioxidants, in general, mitigate muscle repair and hypertrophy. For that reason, AML Preworkout does not contain compounds that principally function as antioxidants (such as vitamins C, E and the amino acids N-acetylcysteine and taurine), allowing for the sufficient natural generation of ROS from training for better muscle growth and recovery. Leucine consumption during and after exercise promotes muscle growth. But taking leucine before exercise seems to diminish muscular performance by inhibiting conversion of glycogen to glucose within muscle cells, insulin signaling, desensitization and insulin resistance. Also, leucine has the ability to competitively inhibit dopamine production by preventing the update of dopamine precursor tyrosine into the brain. This would cause CNS fatigue and ultimately hinder exercise performance. That’s why AML Preworkout is absolutely leucine free. Since reduced dopamine levels within the CNS decrease motivation and performance while inducing fatigue, novel ways to increase dopamine production before your workout should boost exercise performance. The consumption of the dopamine precursor tyrosine was recently shown to provide this benefit in a double-blind study, confirming that tyrosine consumption influences the ability to tolerate prolonged exercise, conceivably by increasing dopamine levels. AML Preworkout combines tyrosine with folic acid, which may further increase dopamine by increasing tetrahydrobiopterin (BH4) levels. As a co-factor for tyrosine hydroxylase, BH4 facilitates the conversion of tyrosine to L-dopa, which is a precursor to dopamine. The tropical plant mucuna pruriens is also found in AML Preworkout. This ingredient is loaded with the dopamine precursor L-dopa, which has been shown to effectively increase diminished dopamine levels in patients with Parkinson’s disease.